I drew again a body, neck and head, then arms and legs. avoiding the staining process altogether. This time I didn't cut all the pieces before I sewed them together. 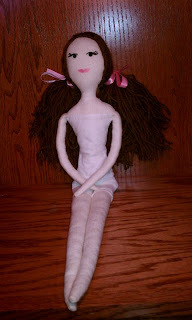 Instead, on the fabric I traced the body/neck/head, 2 legs and 2 arms. I put another layer under the piece with traced pattern. There were now 2 layers of fabric. Then I sewed them. leaving an opening only at the bottom. leaving an opening at the "shoulder". leaving an opening at the "hip". 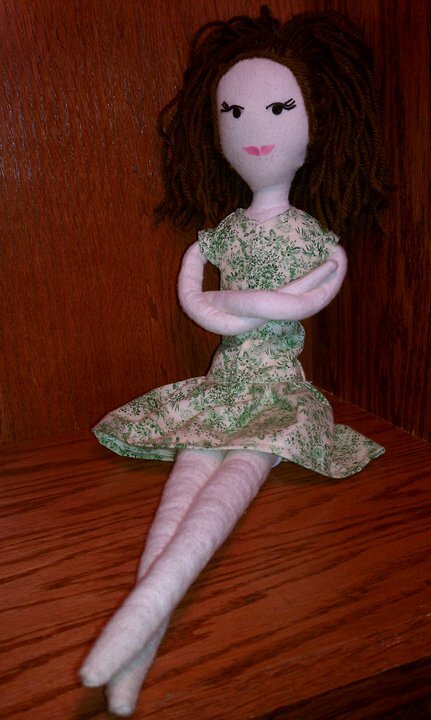 and sewed her arms and legs to her body. I found my stuffing laying around our living room. and I had been throwing it away. That day I had asked them to pick it up and throw it away. Just to realize it's perfect for my doll! and I had never been so happy when my children disobeyed me! They didn't make it to the trash can, they just threw it on the floor! Now back to the doll. It was now time to give her a face. shaped her eyes and eyelashes and let them dry on my finger. I then applied fabri-tac to the eyes and glued them to her face. and glued them on with fabri-tac as well. and used fabri-tac to glue it to her head. Then I gave her a hair cut. and then gave her layers. Even then I wasn't done. and glued them on with fabri-tac. And as perfect as she may seem... she is not. Her "hair" is too heavy for her head, causing her head to fall backwards. and stuck a rolled up piece of stiff interfacing. Then I stitched her neck back up. 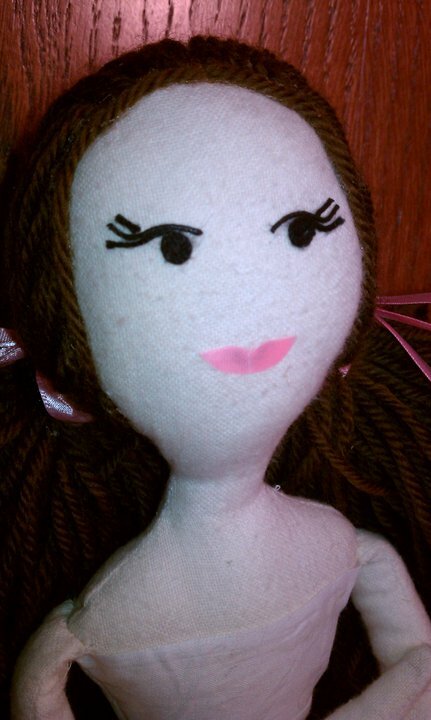 Maybe I'll make another doll and write a tutorial? There is a likelyhood that I am about to become a stay at home (possibly homeschooling) mom with two girls too - This is Definitely something I'll consider doing!